Last week was a rough one for our family. Not only did Gramma leave (we are all still in mourning), but my son was accidentally injured (though under close parental supervision) while playing with A Specific Outdoor Toy That Will Remain Nameless. His accident spurred an impromptu trip to the emergency room late Sunday night, and though he will recover fine and has garnered manly attention for his first boyish injury, the whole incident was a lot for both him and his parents. After a long night at the ER, we laid our son down around 2am, thinking he would be exhausted from the day’s events. However, he ended up only sleeping a couple of hours and not much during the next day, either. Although he was so sleepy he couldn’t keep his eyes open, he kept jolting awake every other minute and couldn’t settle into a restful sleep. This made him start crying because he couldn’t stay asleep, which led to him being more overtired… and… well, you get the idea. He (and I) was a mess. After only 4 or 5 hours of sleep in the last 24 hours, Monday night found me cradling my sleepy boy in my arms and praying for wisdom. No matter what I tried, he could not stay asleep. Every other minute, my poor boy’s arms would flutter open with wide strokes, and he would stare at me with wild eyes as he burst into tears. My heart was broken. I tried swaddling his arms like I did when he was an infant, but this didn’t seem to help much. I continued to rock him in our recliner and breathe out desperate little prayers. Lord, please heal my baby. Please bring him comfort. Please be his peace. Minute after minute, he continued to jolt and cry. He looked so exhausted as he tried to settle down, and the cycle would start again. I continued to rock him and tried not to panic. In 8 years of mothering, I’d never experienced anything like this before. As a tried to comfort my son, I began to sing his lullaby, a song I’d made up and been singing to him since birth. Mama loves Jaron, I love you. I’m not sure which umpteenth repeat I was singing when the tears started falling. In the midst of motherly exhaustion and the guilt I felt that my son had gotten hurt in the first place, I was overwhelmed with love for him. 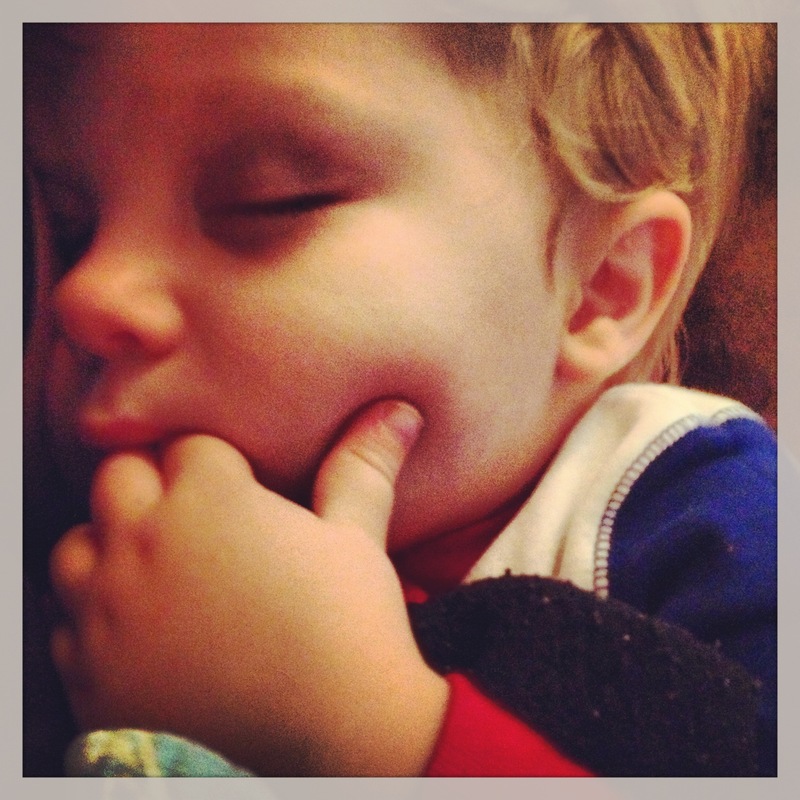 I felt that God-given, Crazy-Protective-Mama-Bear feeling creep up, and I vowed to sing that song all night if needed, so my boy would sleep. Slowly, slowly, over the next hour or two my son relaxed. His jolting lessened and his breathing deepened. I continued to sing, curled into a ball with his face pressed against mine and my tears dampening his sweaty head. Over and over I sang his song, which wasn’t more than a whisper by this point. So many times I come to my Father frustrated with my “junk.” Knowing that I shouldn’t be holding on to the things I’m holding on to. Knowing I’m offended by something Ridiculous. Other times, I come crying to Him because I am simply overwhelmed by the world I live in. It is changing too fast for a girl who doesn’t want cable TV and doesn’t know who the Kardashi-whats are. Some days I don’t feel like fighting against the constant barrage of Worldly Crap and Values that rages against the very core of Who I love and what He stands for. I get weary of the fighting from both sides. The harsh reality jolts me awake. Steals my affection. Suffers my peace. On nights like this, when the night is too long and the jolts and shudders come without hesitation, I’m so grateful that He doesn’t let go. He pulls me – you – even tighter into His embrace, absorbing the shock and intensity of the world we live in with every push. And guess what? Zephaniah 3:17 shares that He sings over us, too. God sings. Not even kidding. A Warrior so mighty, and yet gentle enough to sing lullabies and love songs over His children. I can’t get enough of this amazing God I call Father. Today I pray we find a safe spot to curl up on the stinky carpet and let our Daddy sing over us.